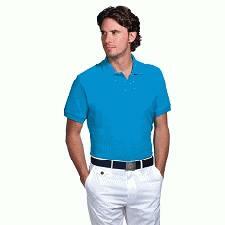 Stylish and professional , our Company Polo Shirt with Logo is the most ideal company gift or business freebie to ensure an effective promotion and exposure of your company brand name and logo to anybody who see's it. Practically any colour is available, and combined with years of producing top quality embroidered business uniforms,clothing, workwear and embroidered promotional clothing, we can ensure a high quality line of logo branded workwear at low cost. Why not have your staff wearing the brand name of your company to show professionalism? * cuffed sleeves and 3 matching button placket. * Available in ladies and childrens sizes.